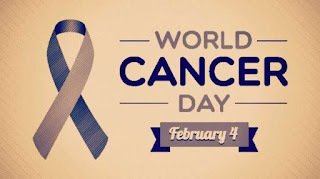 World Cancer Day is observed every year on February 4th. The day is observed to save millions of preventable deaths each year through education, raising awareness and by pressing governments and individuals across the world to take action against the deadly disease. On the World Cancer Day, the Union for International Cancer Control launched a new 3-year campaign with the theme: "I Am and I Will". Approximately one in five men and one in six women worldwide develop cancer in their lifetime, and one in eight men and one in 11 women die from the disease. In India around 2.25 million cases with over 1 lakh new cases being registered every year. The disease led to nearly 7 lakh deaths in 2018. The Indian Council of Medical Research (ICMR) estimates that India is likely to register over 17 lakh new cases and report over 8 lakh deaths by 2020. If some serious interventions are not made to alter the course of the disease, the global burden is expected to rise to close to 30 million new cases by 2040. Q. When is the World Cancer Day observed every year?